I, for one, welcome our new Mars desert-dwelling overlords. It’s a question I’ve been pondering for some time: if we discover microbes eking out an existence on Mars, what might they be called? At first, I presumed it would be a variation on how we designate microbial names on Earth. Something like Staphylococcus aureus but swap out the “aureus” for “ares” (Greek for “Mars”, the god of war) or … something. As you can see, biology isn’t my strong suit and butchering Latin and Greek is all in a day’s work. So, feeling out of my depth, I decided to leave that thought alone and file the idea under “Interesting, But Needs More Research.” That’s where the topic stayed for a while; I wanted to wait for a related piece of science to appear in a journal that could be a catalyst for my question. And last week, that research surfaced. I saw my opportunity. 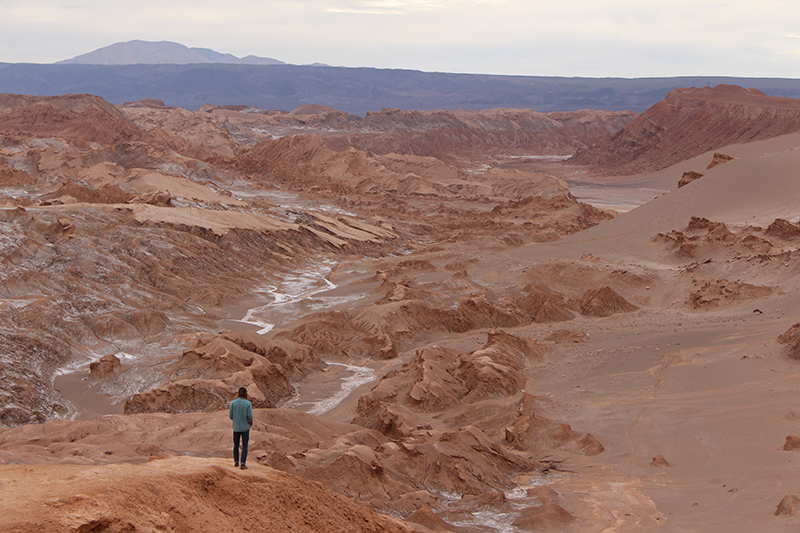 The Atacama Desert is an amazing place. Having visited the ESO’s Paranal Observatory and the Atacama Large Millimeter/submillimeter Array in 2016 as a lucky member of the #MeetESO team, I have first-hand experience of that extreme and breathtaking region. While driving between sites, we’d often go for hours without seeing any vegetation or life of any kind. Atacama is the driest place on Earth; its salty, parched soil is bombarded by ultraviolet radiation, and the core of the desert doesn’t receive rain for decades. But just because life isn’t obvious in the arid ‘scapes, that doesn’t mean it’s not there. The flora and fauna that does call Atacama their home are very specialized in finding ways to thrive. On the smallest life scales, for some microbes that means living underground, which makes them very interesting organisms indeed. In a new study, published in Frontiers in Microbiology, the results of a mock-Mars-life-hunting rover campaign in the Atacama Desert’s core have been revealed. The research was driven, in part, to develop techniques for robotic missions to the Red Planet that will seek out alien bacteria that may be holed up in an underground colony. Remember, Mars has the same land area as Earth, so there’s a lot of real estate to search for microscopic lifeforms. Sure, scientists are smart and can narrow down potentially-habitable regions that they can drop a life-seeking robot on, but once landed on that toxic soil, what kind of methodology should they use to look for these hypothetical bacteria? The Atacama Desert makes for a decent analog of Mars; it’s very dry and its soil is laced with toxic perchlorate salts, so if microbes on Mars bear any resemblance to the nature of microbes in the Atacama, scientists can take a stab at predicting their behavior and guide their Mars rovers to the most likely places where they might be hiding. Researchers already know that bacterial life occupies even the harshest Atacama regions, but according to team leader Stephen Pointing, a professor at Yale-NUS College in Singapore, the microbes we are familiar with are common species that live on the surface, using sunlight for energy. But Pointing isn’t so interested in what’s on the surface; his rover is fitted with a drill and extraction system that can take samples of soil from underground. During the campaign, Pointing’s team made some compelling discoveries. These subsurface microbes are known to science — they have been found in deep mine shafts and other subterranean environments — but they’ve never been found living under the surface of the world’s most arid region. They’ve also fine-tuned their evolution to specifically adapt to this harsh environment. “The communities of bacteria that we discovered were remarkably lacking in complexity, and this likely reflects the extreme stress under which they develop,” said Pointing. The biggest discovery made during this research was that the subsurface colonies of bacteria were very patchy, said Pointing, a factor that will have ramifications for the search for their Martian cousins. “The patchy nature of the colonization suggest that a rover would be faced with a ‘needle in a haystack’ scenario in the search for Martian bacteria,” he said. This research is a fascinating glimpse into how Earth-based environments are being used to better understand how alien bacteria may evolve in their native environments. But the desert-thriving, methane-munching bacteria of the Atacama may also inspire their name — should they be discovered one day. So there we have it, an answer to my question about what our Martian neighbors might be called, if we find them: Planeta-desertum superstes, the desert planet survivor. Author Ian O'NeillPosted on March 4, 2019 March 4, 2019 Categories Earth, Mars, PlanetsTags astrobiology, Bacteria, biology, extraterrestrial life, life science, Mars life, Mars Rover, microbes, microbiology1 Comment on What Might We Name the First Mars Microbes? Fortunately for life on Earth, our planet has an ozone layer. This high-altitude gas performs an invaluable service to biology, acting as a kind of global “sunscreen” that blocks the most damaging forms of ultraviolet radiation. Early in the evolution of terrestrial life, if there were no ozone layer, life would have found it difficult to gain a foothold. So, in our effort to seek out exoplanets that are suitable for life, future telescopes will seek out so-called “biosignatures” in the atmospheres of alien worlds. Astrobiologists would be excited to find ozone in particular — not only for its biology-friendly, UV-blocking abilities, but also because the molecule’s building blocks (three oxygen atoms) can originate from biological activity on the planet’s surface. But in a new study published Wednesday (Nov. 29) in the journal Monthly Notices of the Royal Astronomical Society, researchers modeling atmospheric dynamics on tidally-locked “habitable zone” exoplanets have concluded that finding ozone in these exo-atmospheres may be a lot more challenging than we thought. Recently, two exoplanets have taken the science news cycle by storm. The first, Proxima b, is touted as the closest temperate exoplanet beyond our solar system. Located a mere 4.22 light-years from Earth, this (presumably) rocky world orbits its star, Proxima Centauri, at just the right distance within the habitable zone. Should this world possess an atmosphere, it would receive just the right amount of energy for any water on its surface to exist in a liquid state. As liquid water is essential for life on Earth, logic dictates that life may be possible there too. Also, Proxima Centauri is an angry little star, blasting its locale with regular flares, irradiating its interplanetary space with X-rays, UV and high-energy particles — things that will strip atmospheres from planets and drench planetary surfaces with biology-wrecking radiation. As I’ve previously written, Proxima b is likely a hellhole. And things don’t bode well for that other “habitable” exoplanet TRAPPIST-1d, either. But let’s just say, for astrobiology-sake, that a tidally-locked world orbiting a red dwarf does host an atmosphere and an alien biosphere has managed to evolve despite these stellar challenges. This biosphere is also pretty Earth-like in that oxygen-producing lifeforms are there and the planetary atmosphere has its own ozone layer. As previously mentioned, ozone would be a pretty awesome molecule to find (in conjunction with other biosignatures). But what if no ozone is detected? Well, according to Ludmila Carone, of the Max Planck Institute for Astronomy in Germany, and her team, not finding detecting ozone doesn’t necessarily mean it’s not there, it’s just that the atmospheric dynamics of tidally-locked worlds are very different to Earth’s. Earth’s ozone is predominantly produced at the equator where sun-driven chemical reactions occur high in the atmosphere. Atmospheric flows then transport chemicals like ozone toward the poles, giving our planet a global distribution. When carrying out simulations of tidally-locked worlds, however, Carone’s team found that atmospheric flows may operate in reverse, where atmospheric flows travel from the poles to the equator. Therefore, any ozone produced at the equator will become trapped there, greatly reducing our ability to detect it. So the upshot is, until we have observatories powerful enough to study these hypothetical exoplanetary atmospheres — such as NASA’s James Webb Space Telescope (JWST) or the ESO’s Extremely Large Telescope (ELT) — we won’t know. But modelling the hypothetical atmospheres of these very alien worlds will help us understand what we will, or won’t, see in the not-so-distant future. Titan is a very strange moon. Orbiting the ringed gas giant Saturn, Titan is the only moon in the solar system that sports a thick atmosphere. Although the moon is extremely cold, its atmosphere is very dynamic; exhibiting seasons, precipitation and even creating vast seas. Although this may sound very much like Earth’s atmosphere — where water evaporates from the oceans, condenses as clouds and precipitates as rain, forming rivers that flow back into the oceans — Titan’s atmosphere is dominated by a methane cycle, not a water cycle. This may sound like the antithesis of Earth’s life-giving chemistry, but astrobiologists have been gradually finding clues to Titan’s habitable potential and today (July 28) scientists have announced the confirmation of a key molecule that could be the proverbial backbone to a weird kind of “alternative” alien life on Titan — based not on liquid water, but on liquid methane. “The presence of vinyl cyanide in an environment with liquid methane suggests the intriguing possibility of chemical processes that are analogous to those important for life on Earth,” said astrochemistry researcher Maureen Palmer, of NASA’s Goddard Space Flight Center in Greenbelt, Md. Palmer is lead author of a study published in Science Advances describing the detection of vinyl cyanide (also known as acrylonitrile) at Titan using the awesome power of the Atacama Large Millimeter/submillimeter Array (ALMA) in Chile. Previous observations of Titan’s atmosphere by NASA’s Cassini mission and chemical modeling of the moon’s surface have hinted that it is the ideal environment for vinyl cyanide to form. But it was only when analysis of archived data collected by ALMA between February to May 2014 was carried out that its presence was confirmed. And there appears to be a lot of the stuff. So what is vinyl cyanide and why is it so important? The molecule (C2H3CN) has the ability to form membranes and, if found in liquid pools of hydrocarbons on Titan’s surface, it could form a kind of lipid-based cell membrane analog of living organisms on Earth. In other words, this molecule could stew in primordial pools of hydrocarbons and arrange itself in such a way to create a “protocell” that is “stable and flexible in liquid methane,” said Jonathan Lunine (Cornell University) who, in 2015, was a member of the team who modeled vinyl cyanide and found that it might form cell membranes. “This is a step forward in understanding whether Titan’s methane seas might host an exotic form of life,” Lunine, who wasn’t a member part of the team that announced today’s results, said in a statement. When studying Titan’s nitrogen-rich atmosphere, ALMA detected three unambiguous millimeter-wavelength signals produced by vinyl cyanide that originated from 200 kilometers above Titan’s surface. It is well known that the moon’s atmosphere is a vast chemical factory; the energy of the sun and particles from space convert simple organic molecules into more complex chemistry. These chemicals then cycle down to Titans rich hydrocarbon surface. But speculating about life on Titan is a hard task. The moon’s atmosphere is often compared with that of early Earth’s, but there are some huge differences. Titan is crazy-cold, averaging around 95 Kelvin (that’s an incredible -178 degrees Celsius or -288 degrees Fahrenheit); at no time in history has Earth’s atmosphere been that cold. Also, it’s thought that early Earth had large quantities of carbon dioxide in its atmosphere, Titan does not. As for water? Frozen. Oxygen? Forget about it. So this research underpins our quest to find the chemistry of life as we DON’T know it, using the building blocks that follow the pattern of life that we do know, but swapping out key components (like water) to see if an analog of life’s chemistry can under very alien conditions. Perhaps it’s time for a return mission to Titan’s extreme surface.